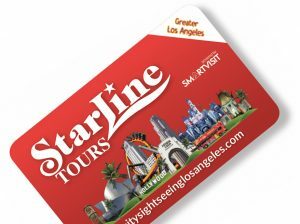 We're very happy to share with your the brand new L.A Attractions Pass from Starline Tours. The Starline Pass allows you to enjoy the best attractions, tours and experiences across Hollywood, Beverly Hills Santa Monica and Downtown Los Angeles and as always you can save money when you do so, up to 50% in some cases! The Starline Pass includes unlimited Hop On Hop Off bus rides aboard the Starline buses as well as entrance to your choice of up to 25 top attractions including Pacific Park, OUE Skyspace LA as well as Movie Stars Homes Tours and Behind the Scenes tours. Starline Passes are available for 1, 2 or 3 days with the 3 day also including your choice of Warner Bros. Studio our or Universal Studios Hollywood tour! A great way to see more of L.A and save up to 50% on usual prices, so what are you waiting for!